I would like to ask about introducing a puppy into a household where I have a 6-year-old Golden Retriever. Ema (my golden) is healthy, active and very friendly. I am concerned how she will react to a new member of the family. Ema has been my companion for 6 years but 4 years ago I lost my mother and Ema was my sole companion and helped me get through a very bad time. I may have depended on her too much and overdid the attention she got. I am worried that she may react to the new puppy in a negative way. I know she won’t be aggressive but I am concerned she may fret since she has been the sole recipient of my love and attention. I have had many dogs visit and she always accepted them and played with them. She is a very social dog. My biggest concern is that she will become despondent. I know if I bring the puppy in that I will have to be sure Ema still gets lots and may be a little extra attention but I am concerned that she just might hide, not eat or countless other things. Possibly a 6 year old dog might be too old to introduce a new puppy? I’m not sure. Please advise me if possible what you think. It would be unusual based on what you’ve told me that she would find this anything other than a positive experience. There are situations where I’ve found that two dogs are just incompatible but yours doesn’t have any of the red flags, in fact just the opposite. People can be particularly antsy when one of the two housedogs is a pup and it’s on the receiving end of a little dog-to-dog discipline and you might confuse “parenting” for resentment. Again, generally speaking the older dog knows exactly what it’s doing which is teaching boundaries of acceptable behaviour, at least as far as its own comfort zone goes. Not too much, not too little. You’ll be on your own as far as establishing your idea of acceptable behaviour with you. Introduced properly most dogs sooner rather than later find a balance as to which is going to have say over what and it’s normal for dogs living together to have scuffles once in a while. Problems can arise if the dogs’ owner keeps interfering with the dust-ups before they have resulted in a conclusion satisfactory to the dogs. Unresolved issues can result in an escalation of aggression so it’s usually better to let them work it out. Easier said than done though as the difference between a dog argument and a dogfight is like the difference between Donald Trump on a clever and not so clever day. You know there must be a way to tell but either way all you want to do is to find a way to make it stop. Make the introduction off property if you can. Tire out both dogs before the meeting and leave the puppy in the crate in your house until your dog has had a chance to investigate and you for a feel for which way the wind blows. When it’s time for nose to nose outside of the crate, leave Ema’s leash on and keep it slack so you don’t tense her up but not so slack that you can’t stay on top of things should the need arise. I have 4.5 yr old female lab. I brought home a 6 week old female lab. The 4.5 yr old charged her! We are terrified! What can we do to stop this behaviour? Please help with info and advise. I have 2 chorkie dogs brother and sister 1 year old. Now have a Shepard (male) puppy coming at 8 weeks old. How do I handle this??? What have you done to prepare the dogs for meeting other dogs so far? For instance, how well do they respond to you around other dogs to requests from you to stay, keep the leash loose, or to come? Also it’s not just the matter of them having their initial meeting and early days going well which I briefly covered in the above column. The two Chorkies are adolescents and the pup a toddler. The way they are wired to treat another dog is quite different at this stage of life. When dogs in multiple dog households hit adulthood the dynamic can change dramatically, particularly if the way their owner hasn’t firmly established who’s living in who’s house. They can be more competitive with each other over perceived resources if not. You’ve also chosen to introduce a physical incompatibility. 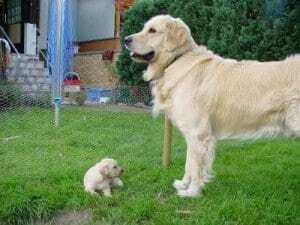 Even in play the disparity in the breed’s sizes can prove serious, even fatal. There are considerably more red flags in your situation then the letter but if you supervise diligently, train properly you should have a shot at it. Genetics might impact their behaviour though as well as socialization history. I have a 7 year old golden retriever who seems to still have her puppy ways. She is usually obedient but I see her working very hard to be able to reign in her rambunctiousness particularly when someone enters the house. We are wanting to introduce a new puppy that is not a golden retriever, but a mix of other breeds. What is the best way to do this? The best way is to do so on neutral territory several times if possible ideally preceded by both dogs getting some serious cardio vascular exercise before hand. If all goes well carry on from the neutral territory into the permanent home. If the youngster is crate trained you can use the crate to give your dog a chance to adapt when you can’t supervise. There are other things that should be considered that relate to personality traits that are breed and gender specific as well as personality quirks that may exist in any individual dog influenced by their past, especially their critical socialization period. My boyfriend has a female black lab, Rousey, that is almost one and I just adopted a rescue mix puppy that is also female. My puppy, Bella, is about 3 pounds and will probably be pretty small. My boyfriend and I live separately but we want the dogs to get along. We’ve introduced them twice and the lab seems happy but doesn’t seem to know her strength which makes Bella scared and unsure of how to play. Can you help us develop a plan to have them get along? We spend a lot of time together and just want them to be best friends too. Thank you! You could exercise Rousey vigorously for a while before each meeting. Also leave Rousey’s leash on so you can interrupt her before she gets too worked up. Keep in mind though that if you can’t get Rousey to listen to you reliably in other areas of life getting her to listen in others is just as unlikely. I have a almost 12 yr old golden. He is used as a therapy dog..great w children, other dogs but def. Carries himself as dominant..
4 yrs ago he was ON leash and a 100 lb pit got away from owner went straight for his neck.. Stitches ect. Now, off leash in open space he is FINE w other dogs.. But, if Im w him on leash I have seen an introduction into a non biting but loud argument w another dog. I tried adopting a Maltese when he was 7 in 2 yrs he NEVER gave into this dog.. The min. The dog came near me it was a growl.. And attention game…he finally won.. We found a fantastic new home for Maltese. However, this dog is my soul mate has lit. Saved my life medically. But, I had always planned on another golden as he got older. Hearing it can help keep them around longer. On the other hand, I feel like its selfish..he’s been only guy 12 yrs.. And health is not 100% so is it unfair to introduce a new dog. Should I just enjoy this blessed time w just him?? Imhave a 3 yrs lab a shih tzu and a yorkie My shih tzu is having a puppy Imhave had to separate them as the shiha tzu and lab both females have been having some fights as the pregnant shih is king of grumpy. How to introduce puppy and when to the lab Uschi. She is sweet but tend to be possesive and jealous with me. You however have some other factors that influence behaviour – the pregnancy. It’s a little too late to suggest maybe breeding a dog when you haven’t got good control over any of them, mightn’t be the best idea. Connect with some experienced breeders to get some first hand advice about pregnancy aggression woes. Connect with a trainer to learn how to train the dogs to respect your wishes and learn how to mitigate things in the mean time. Hi John, I have a male 12 year old shih tzu who is very docile, with very low energy. He seems to get along fine with other dogs he meets and he doesn’t have an aggressive bone in his body. We are considering adopting a 2-3 year old. Any suggestions what to look for in adding this new family member? Here are some articles I’ve written on the topic. Let me know if they stimulate any further questions. My brother has a 12 year old schnauzer and has rescued & brought home 2 labrador puppies and until he decides who to give one to, he has them at home. After bringing them home he now has problems with his older dog. The schnauzer has even growled at the puppies and he doesn’t know what to do to help these dogs get along well together? An older dog with two puppies that are disproportionate in maturity and physical size that didn’t growl would be more the exception to the rule. I would prefer for you to send some video of what is occurring that concern you but generally speaking when a dog is aged and/or is physically much smaller than the other younger breed (let alone two of them) the dog’s owner has to take a more active role in supervising and laying the law down with the puppies. This may be worth a read as well. There are quite a few articles on my site about this topic. Type “second dog” into the search bar. I am rehoming my parent’s 3 maltese dogs (2 females and 1 male) who are between 9 and 13 years old, to my home where we have a 1 year old female labrador. My parent’s dogs have lived inside since birth but we have to keep them outside at my place. So theres a lot of changes going on. How do i get the 3 to stay outside, and how do i socialise them with my lab without causing conflict? My lab is friendly, has been around other dogs at puppy school but has never had other dogs living with us. Please advise. I can’t imagine that 3 dogs that have lived inside with human companionship since birth will ever do any more than at best get used to being outside. If they’ve been imprinted on ongoing human contact I wouldn’t be surprised if you didn’t see a deterioration in their physical and/or mental health inside a year. Have you considered rehoming them? The problem there is that depending on what they’re like it’s hard to find a home for even one dog in that age range, let alone 3 all together. How do you think they would be if you split them up? If you had to go that route, I’d suggest looking for homes where there is already a similarly social dog living there as that would have canine companionship as well making it the closest match to their life history. We have had had a 12 week golden retriever since she was 7 weeks old. We thought she would love a playmate so we just got another golden retriever that is her same age (12 wks). They each have their separate beds, food bowl, space, etc. but my 1st Golden has gotten so aggressive. She is all over the new puppy. She seems to start out playing but then it turns into a fight. The new puppy retreats & hides from her (after taking the biting, growling, barking, & jumping on her back). She was/is so sweet but now I’m just not sure what to do. She had already starting biting my daughter but we would say “no bite” very sternly. Now we have to say that when she’s biting the other puppy. I give them each love & scratches and still give my first puppy the same brushing, belly rub, scratching, & holding that I always have. We’ve let them run outside to get their energy out & used to playing together but it still eventually turns bad. Not sure what to do. Thought I was doing a good thing by getting her a playmate but maybe not. Our 7 year old golden retriever’s companion dog died. We feel she’s ready for a new companion, What’s best? Male or female? Puppy or older dog? Our dog is an active female, the dog we lost was also female. On average I’ve found that opposite genders get along better. Where problems arise is when the dogs have a bit of drive and the humans that they live with aren’t clear as to who is living in who’s house and the dogs can resource guard over things that they might otherwise not. It’s way more important to be serious about hierarchy in households with more than one dog. Things you could otherwise get away with you are less likely with two or more dogs. The problem with a puppy in these situations is that the personality is a tough read and allowances made for a puppy can change when puppyhood is left behind and the puppy personality might be replaced with an adult attitude less conducive to getting along. Think of the puppy period as the honeymoon months and once adulthood has been reached is when the real marriage is tested. Give some thought as to the personalities and genders of the dogs your surviving Golden Retriever has got along with the best over the years and aim for that.